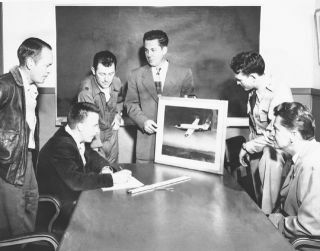 A team of NACA researchers and pilots discuss the XS-1. In this historical photo from the U.S. space agency, NACA Muroc Flight Test Unit XS-1 Team members and USAF Pilots are pictured in January 1948. From Left to Right: Joseph Vensel, Head of Operations; Gerald Truszynski, Head of Instrumentation; Captain Charles Chuck Yeager, USAF pilot; Walter Williams, Head of the Unit; Major Jack Ridley, USAF pilot; and De E. Beeler, Head of Engineers.